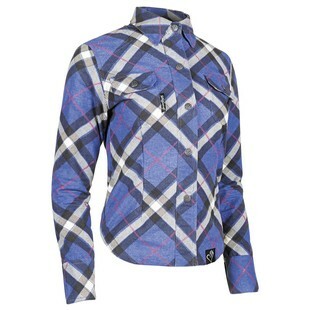 Truly, honestly, and totally honorably, the Speed and Strength Cross My Heart Shirt is a casual (yet tactical) option for women riders in search of a moto-specific button down. With a 100% cotton outer shell, the Cross My Heart motorcycle shirt retains the look and feel of a low-key long-sleeve shirt. At the same time, however, underneath resides Dupont Kevlar reinforcements at at the shoulders and elbows that will serve to increase slide time should it come in unfortunate contact with the asphalt. Additional features of the Speed & Strength Cross My Heart Shirt include shoulder expansion gussets for added mobility, a hidden YKK zipper for the main opening, and a snap-down collar to eliminate buffeting at highway speeds. For women motorcyclists who want to keep their moto-stylings under the radar, or who simply want a lightly protected shirt that can be worn equally as well with the jiffy stand down, the Cross My Heart Shirt from Speed and Strength is a promise made, and a promise kept.